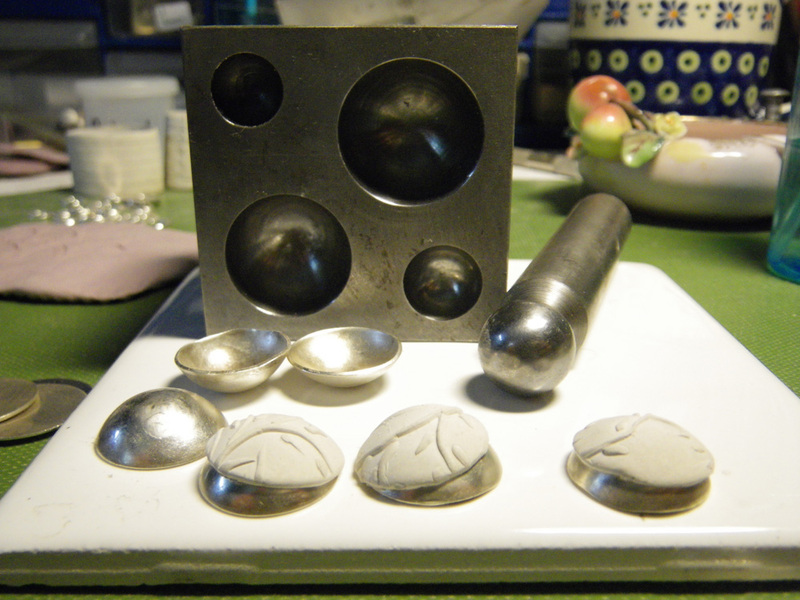 ← Now, where did I put that…..
One of the things I like best about using Precious Metal Clay is that it gives me the ability to make fine silver beads without soldering. I make a lot of the same design beads, though I strive to vary the combinations with other beads so that my necklaces are one of a kind or limited editions. 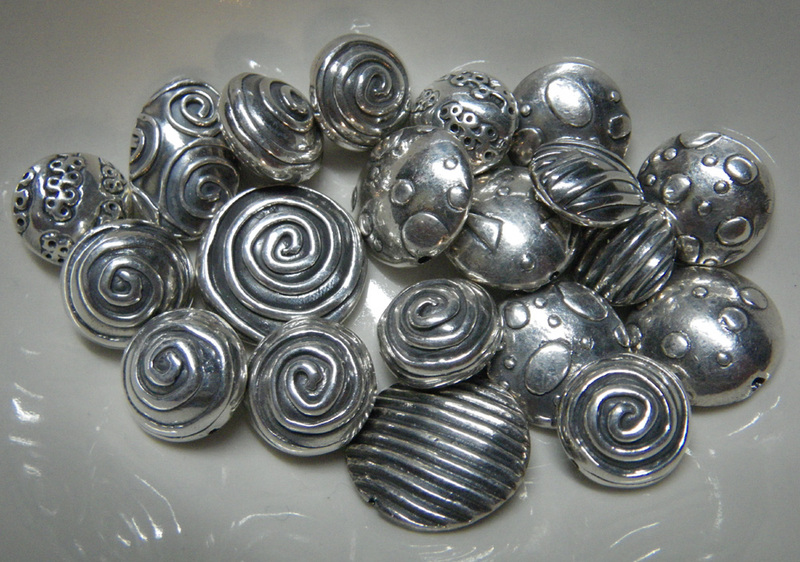 I’m always looking for ways to speed up bead production, especially for hollow formed lentil-shaped beads. 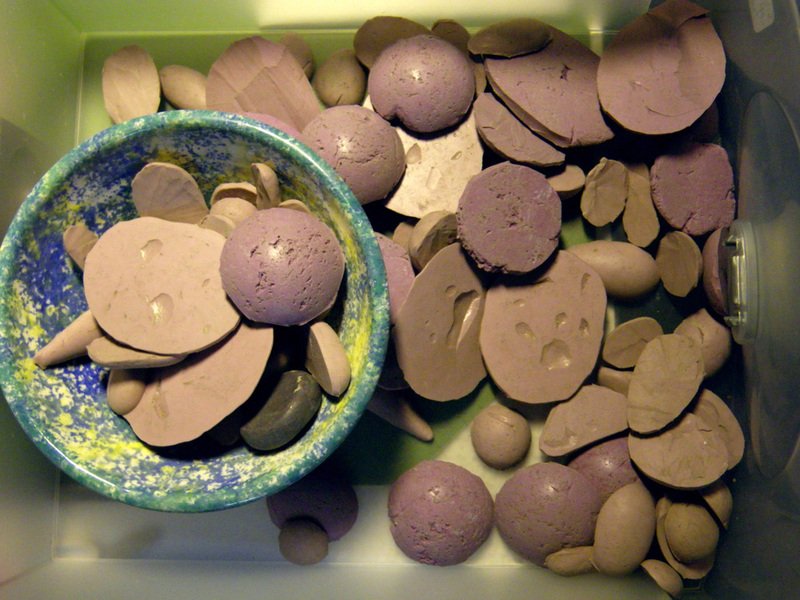 All over my studio I have a variety of items I use to drape the clay discs, creating the convex shape I want, as they dry. I use upside down plastic watercolor palette trays. I also use my own silicone domes. These both work very well, though I usually need to leave the clay halves in place for hours waiting for them to dry enough to hold their curve so I can I transfer them to a cup warmer for the final drying process. I can speed up the initial drying process with a hair dryer, but I always end up blowing stuff around on my bench and creating a mess. I know, I know. A food dehydrator would be very helpful, but I just don’t want to spend the money and I have a tiny studio. Where would I put it? The silicone domes and the watercolor palettes take up enough room already. 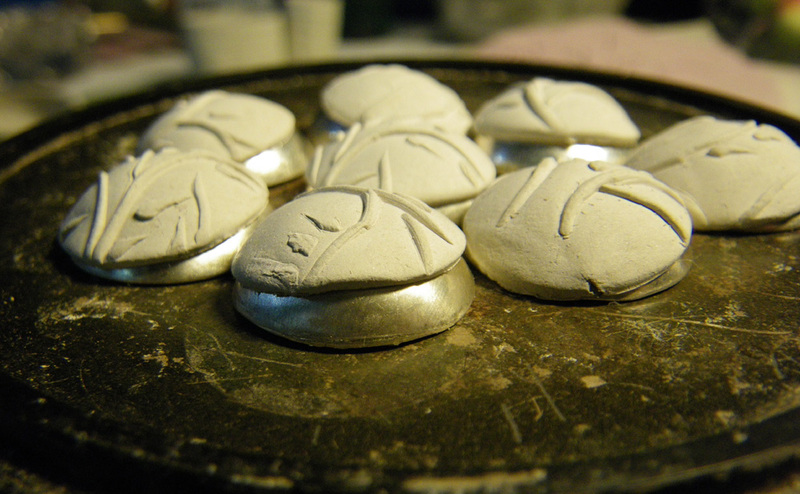 The combination of metal domes and cup warmer dried the clay in minutes. DANG! you are a GENIUS! when are you going to put some of those dapped disks on etsy for the rest of us dumb suckers to buy? HEY, actually, you should copyright that that call it Barb’s Bodacious Drying Disks (BBDD) and advertise! you’ll be RICH! that wait time is sometimes the thing that stops me from working on an idea, cuz’ it won’t come together fast enough for my liking, or how much time i have available…. You know, I do so much bead shopping (or just drooling) on line, that I sometimes think it would be fun to just have a site for selling beads and components. also, this blog should have a search bar…..i need to go back months and months to find your coffee grinder tutorial…i bought the grinder, now how to re-hydrate without making a god-awful mess?! Hey, that is an EXCELLENT idea! I just tried to put on a search bar, but I don’t think it’s very effective. Maybe because I don’t know how to set up my blog entries to make it effective. Hmm… I wonder if that’s what that category check box is for…. thanks for the link! i don’t have NEARLY that much dust, but it’s a start! 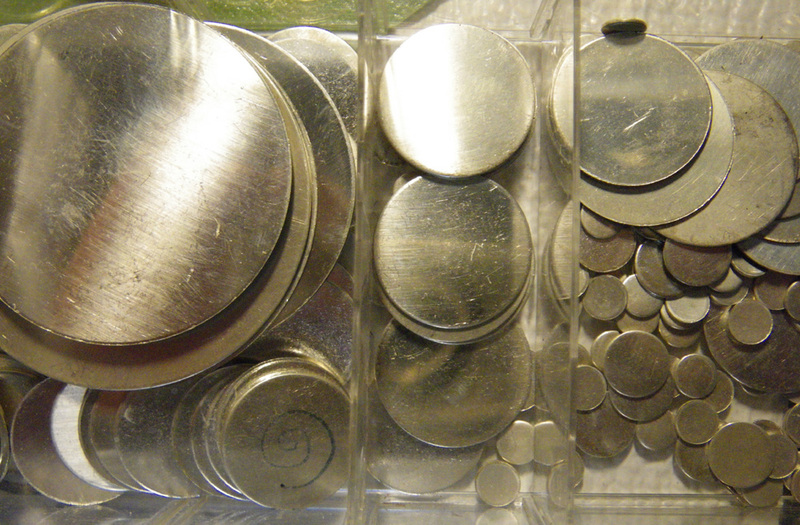 those are REAL silver disks?! i thought they were silver-colored!!!! when you start your BBDD business they should definitely be COPPER! have you registered for the conference yet? paid the balance to celie? i have done neither, and no plane ticket, either! i’d best get a MOVE on! Thanks to you I just put a separate section on the blog with links to Tips and Tricks. very good suggestion. I have not paid the balance to Celie yet, but I’m set on those other things. You better get on the ball! I signed up to stay in the new dorm. Well, they are only silver b/c that’s what I had on hand. If you have any unfired clunkers that you can’t decide what to do with, they grind up very nicely in the coffee grinder. Once again, pure genius. I made a little screened riser so I can put plastic forms on my cup warmer without melting the plastic eggs, polymer forms and other melty stuff. I have a convection oven on the porch, but the cup warmer is so convenient to have right on the bench. I saw Holly’s comment about paying the balance to Celie. I’m signed up for her Sept 18th workshop. I would be just giddy to learn that you two gals are going to be in the same session. Could it be?? OMG! More fun on Sept. 18! Yes, that is the class that Holly and I have signed up for too. Also our friends Marly Penner and Angie Karst (http://www.studio28waterloo.ca/Studio_28/Welcome_Bienvenue%21.html) are going to that session. (We met them last year at the ACS conference in Chicago.) It will be great to have you there too! Can you see me doing the happy dance?! I’ll touch base to see where y’all are staying. I’m planning to rent a car and would be happy to share. I love a good happy dance! We’ll be in touch. 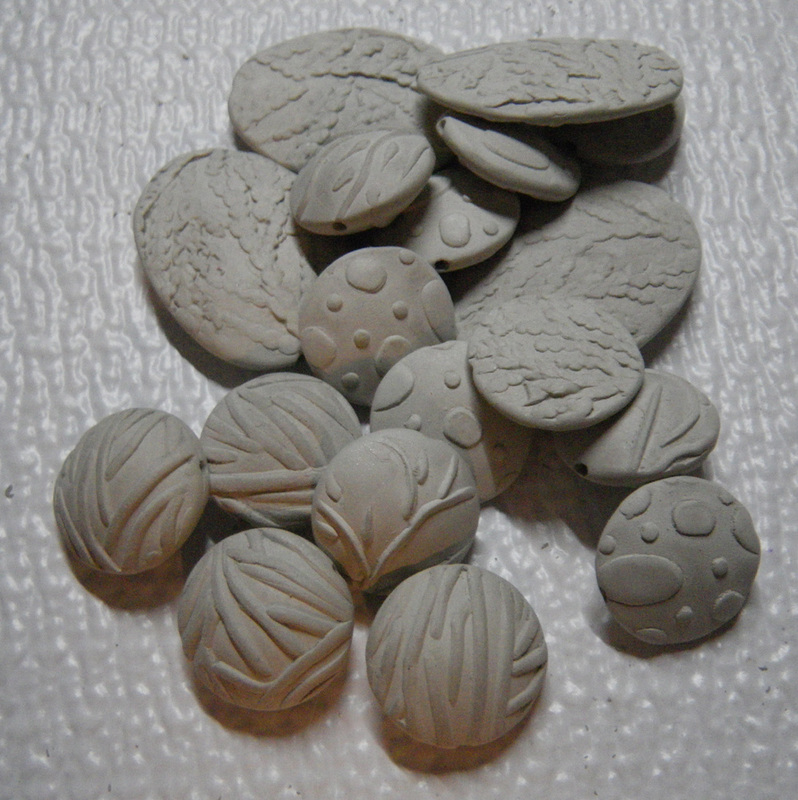 How do make the molds for the hollow beach stone beads? I make a two piece mold from two part silicone that I get from Rio Grande. It’s their version of “Cold Mold.” It’s kind of hard to describe it since it involves first making a mold of one half of the stone, and then setting the stone in place in that half mold and making a mold of the other half of the stone on top of the first half. You’ve given me a good idea for an upcoming blog post and tutorial! It would be easier to show how I do it with photographs. Stay tuned! August is nuts around here as people frantically try to get in as much summer as possible with only a month of vacation left. So, I will post it as soon as I get a chance.